Road Bike Action tested the Bianchi Aria e-Road bike in the January 2019 issue. The $6500 Bianchi weighed just over 26 pounds and by virtue of the rear hub motor and removeable battery, all that was needed was a rear wheel swap to decrease the weight by at least ten pounds to make it a viable non-assist bike. The latest evolution of the performance made in Colnago. The e64 project becomes reality, with the aim of bringing the experience and knowledge of the historic brand to the world of pedal assisted bikes. 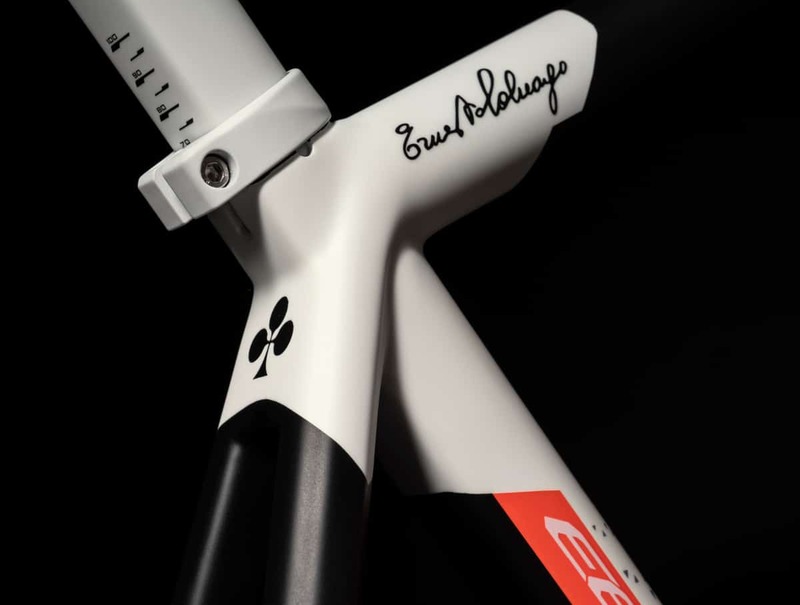 The e64 marks the entry of Ernesto Colnago’s company into the e-road market with the style and quality that have distinguished it for 65 years. The e64 looks like a bike with an exceptionally low weight: only 12 kg, including the battery. This is made possible thanks to a very light frame and fork, in high quality monocoque carbon fiber. The Ebikemotion servo assistance system is the lightest on the market. In fact, the weight of the engine is only 3,7 kg and is capable of developing a power of 250 watts. The engine is located inside the rear hub and the battery on the frame’s down tube. The most visible give-away that the E64 is an e-bike is the on/off switch located on the top tube. The push button is also how the three power modes are accessed. There are three method of use for the assistance, which can be viewed on the luminous button on the top tube. With this button you can turn the system on and off and check the battery charge status. An additional “power pack” will soon be available, which can supply and additional 250 watts and will be placed on the vertical tube, with the appearance of a second bottle. The Ebikemotion system also provides a specific application that can be downloaded to your phone that allows you to make the most of the available potential. Wearing a heart rate belt, it is possible to set a threshold frequency beyond which the intervention of the servo assistance system can begin. Furthermore, a series of more classic and simple features are provided, such as speed, power, slope, gps, etc. The other visual cue would be the oversized rear hub that houses the Ebikemotion motor. The motorizeed rear wheel can easily be swapped out with a a standard wheel. The design of e64 is inspired by the C64 top model. The e64 mounts the Shimano Ultegra R8020 11-speed mechanical group with a hydraulic-type disc brake system.